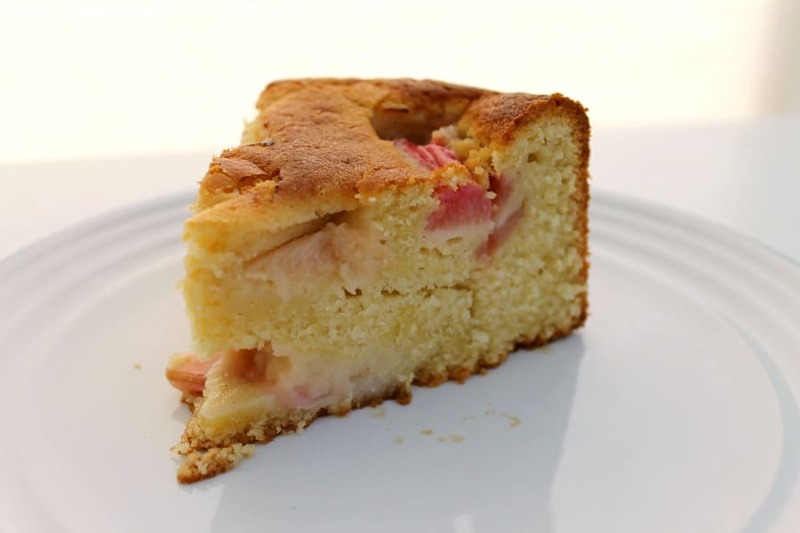 Rhubarb buttermilk cake is a delicious cake with the tang of buttermilk and the sharp sweetness of rhubarb. Lovely for a special occasion or weekend bake. I love it when rhubarb season arrives, it really shows that spring is finally here. As a child we grew rhubarb on our allotment, and stewed rhubarb and rhubarb crumble have always been among my favourites. What is your favourite rhubarb dish? 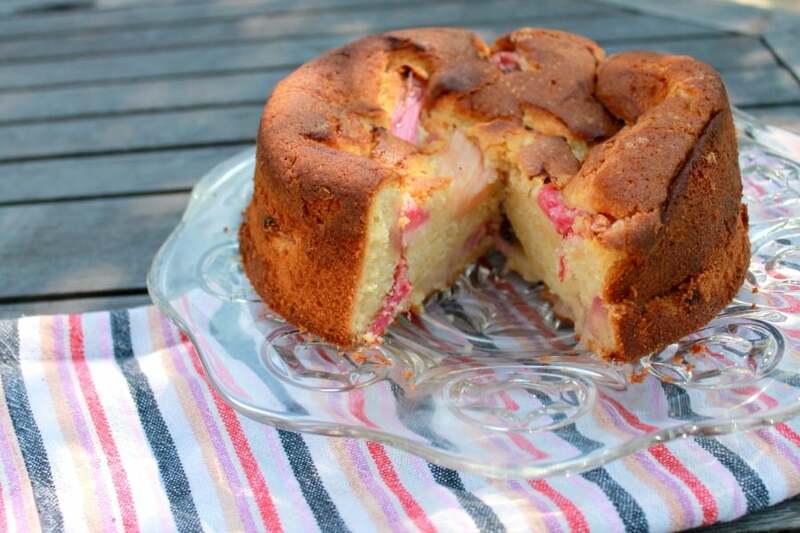 Rhubarb also goes really well in cake of course. 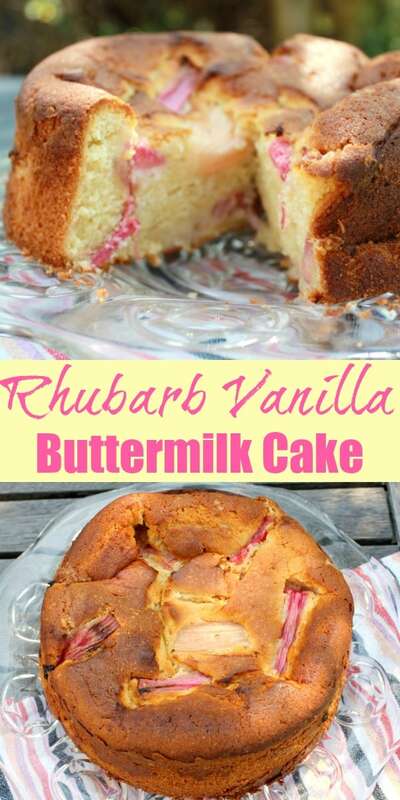 Here I’ve made a vanilla-flavoured buttermilk cake, topped and filled with roasted rhubarb. The buttermilk makes the sponge lovely and soft with a great flavour, and slightly denser than a traditional sponge. 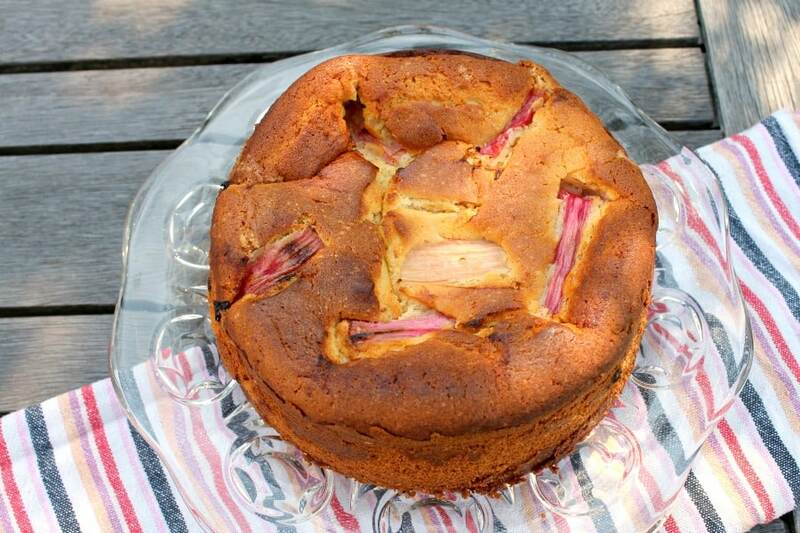 This cake is really easy to make, just remember to roast your rhubarb a little earlier in the day. 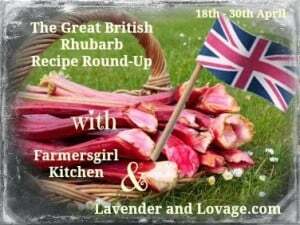 Karen from Lavender and Lovage and Janice from Farmersgirl Kitchen are hosting the Great British Rhubarb Recipe Round-up, and I am linking this recipe up with them. If you need some rhubarb inspiration, pop over and have a look at all the recipes. I will definitely make this cake again, it was a hit with all the family. You can’t beat a slice of homemade cake with a cup of tea can you? How do you prefer rhubarb? Do you grow your own? 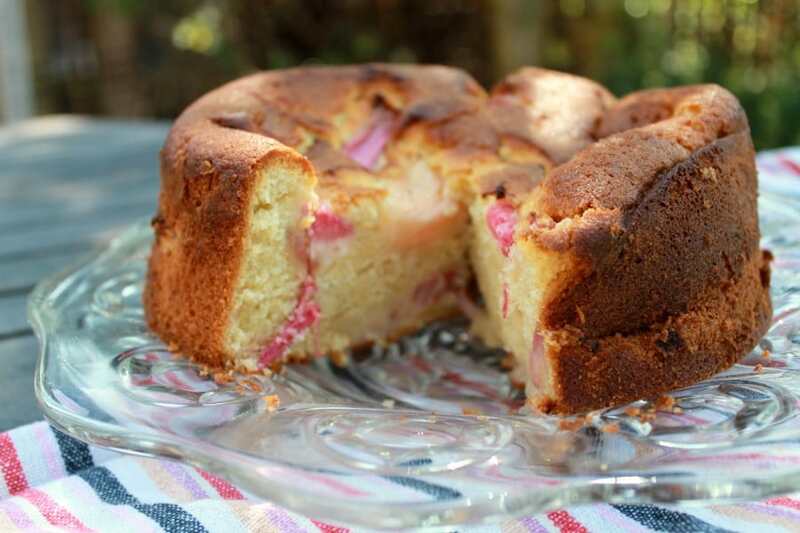 Get the recipe for this rhubarb vanilla buttermilk cake below. 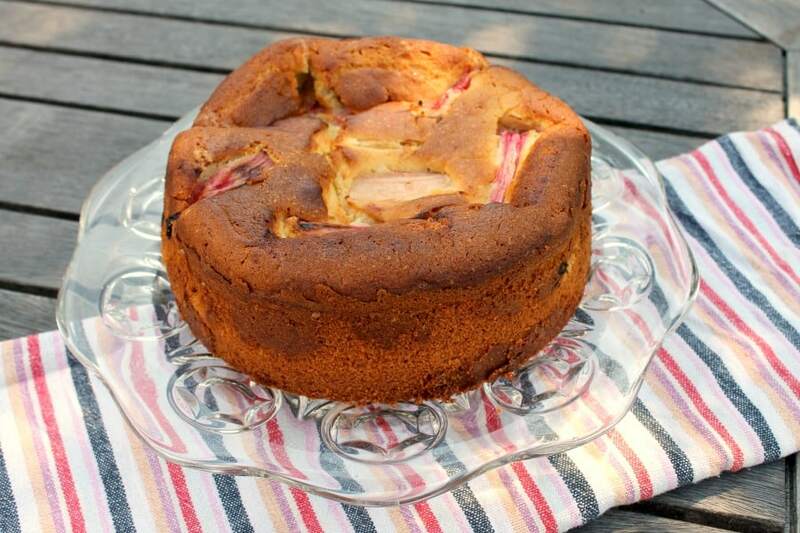 Pin this rhubarb cake for later! Roast the rhubarb by washing it, cutting into small pieces and sprinkling over 50 g caster sugar, then roasting for 15 minutes in a foil-covered dish. Then remove the foil and roast for 5 minutes more. Leave to cool. Add the vanilla bean paste and then the eggs, one by one. Fold in some of the flour, then add some of the buttermilk. Add each in stages and mix in between until all fully added. Place half of the cake mixture in a deep 8-inch/20 cm springform cake tin sprayed with cake release spray. Place some pieces of the roasted rhubarb on top, then add the rest of the cake mixture on top of it. Smooth the top then place more of the roasted rhubarb on top (you may not want to use it all, I had some left over). 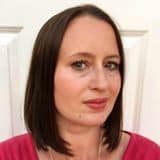 Bake for 50-55 minutes at 180 degrees (preheated oven), or until the cake is golden brown and fully cooked in the centre - check using a cake tester. Ooh this looks so delicious and perfectly seasonal. 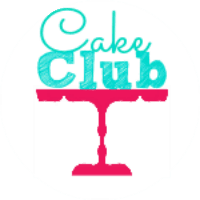 Thanks for entering #cakeclub! Your cake look fabulous !! Thanks so much Winnie! What a shame you don’t have rhubarb. Your cake looks delicious and I like your idea of roasting the rhubarb first.. 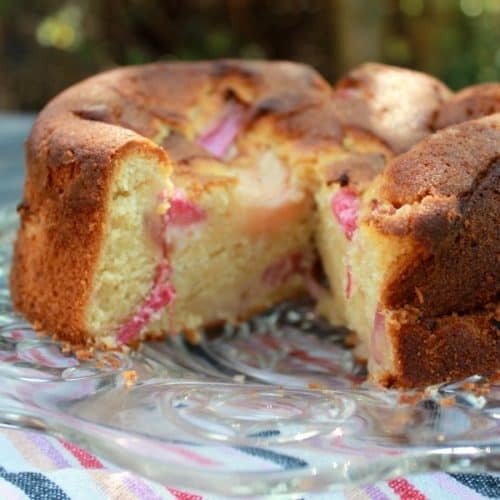 I like a slightly denser cake and I definitely like rhubarb cakes. I made one the other day, but haven’t posted it yet. And last night I had rhubarb crumble – oh heaven! Rhubarb is so good isn’t it! Look forward to your cake. Yum! I love rhubarb! That reminds me, there is a huge rhubarb plant in the garden of this house I’m currently house sitting. I’ve forgotten to check it this spring! Now I’m inspired, thank you! Excellent stuff. The advantages of house sitting! Oh my, it’s a good job I don’t know exactly where you live or I’d be on your door step for a slice of this, looks totally divine! Great, let me know if you do! would it work with apple instead of rhubarb? Should do! No need to roast the apple first I’d have thought. Gorgeous cake. It would be great warm from the oven with lots of lovely home made custard too. Thanks Helen. Great idea, will do that if it gets chilly again tomorrow! 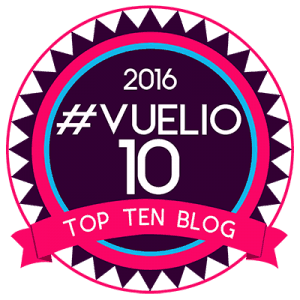 This looks AMAZING, having just had a nose through, I’m following on bloglovin now, this is a lovely blog! I’ve spent ages looking at your posts today, I might need a slow cooker!